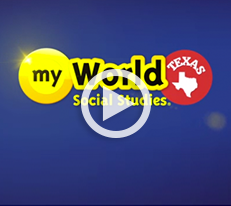 Pearson myWorld Social Studies helps Texas students write theirs! This fun K–5 elementary program, available in English and Spanish, applies the latest research and technology to make storytelling the most effective way to teach social studies. MyStory videos open each chapter and invite Texas students to engage in the personal story of an individual whose life is related to the content. The program is designed to help you address critical knowledge and skill development in the time you have to teach social studies. This program is 100% TEKS-aligned and available in print, digital, and blended options. Select English or Spanish below to see resources for that discipline. ActiveEbook provides an electronic version of the student text with notetaking, highlighting, drawing, and reading support including audio. TikaTok’s myStory Book writing strand provides an exciting opportunity for students to write and illustrate their own digital book. TikaTok also provides you, the teacher, with a creative assessment activity that indicates a genuine understanding of content. myWorld Social Studies new leveled readers includes one intriguing biography per chapter at three reading levels for below, on-level and advanced readers. This allows you to assign “just the right” level reader to each student. These biographies tie directly to the student worktext chapter topics and target reading skills and help students build essential reading skills while also preparing them for high-stakes tests. Students will read biographies of people from various backgrounds who have contributed to the development of the United States. Teacher's Edition for Textbook can be used in tandem with the Student Edition for page-by-page teaching support. ActiveEbook provides an electronic version of the student text with notetaking, highlighting, drawing, and reading support including audio. The complete digital course in Spanish.